Heart attacks are a serious medical emergency that should be seen by a medical professional straight away. The condition, which is also known as a myocardial infarction, is caused by a lack of blood reaching the heart. Without enough blood, the heart could become seriously damaged, and it could even be life-threatening. But you could lower your risk of heart attacks by avoiding sugar-sweetened drinks, it’s been claimed. 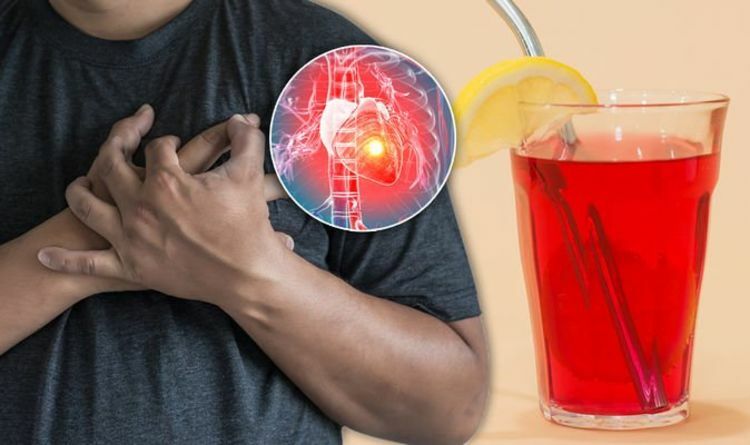 Sugar-sweetened drinks, including energy drinks, sport drinks, and fizzy drinks, could all be raising your risk of premature death, including cardiovascular disease, it’s been revealed. Cardiovascular disease is the name given to a number of medical conditions that affect the heart or blood vessels, including heart disease, and strokes. Drinking two or more servings of the drinks a day could raise your risk of cardiovascular disease by as much as 31 per cent, compared to people that rarely drink them, according to scientists at Harvard. “Our results provide further support to limit intake of sugar-sweetened beverages, and to replace them with other beverages, preferably water, to improve overall health and longevity,” said researcher Vasanti Malik. Harvard’s professor of epidemiology and nutrition, Walter Willett, added: “These findings are consistent with the known adverse effects of high sugar intake on metabolic risk factors and the strong evidence that drinking sugar-sweetened beverages increases the risk of type 2 diabetes, itself a major risk factor for premature death. Women were more likely to be affected by the negative health effects of drinking sugar-sweetened drinks, they added. The findings came after it was also revealed that the drinks increase the risk of weight gain, type 2 diabetes, and even strokes. But you could lower your chances of cardiovascular disease, and therefore heart attacks, by eating a healthy, balanced diet, said the NHS. A balanced diet includes low levels of saturated fat, salt and sugar, and lots of fibre, fruit and vegetables. It’s also crucial that everyone does plenty of exercise, including at least 150 minutes of moderate intensity activity every week. Common heart attack symptoms include severe chest pain, difficulty breathing, and feeling an overwhelming sensation of anxiety. You may also be having a heart attack if you start excessively sweating for no obvious reason. But, everyone reacts differently to a heart attack, and some patients may not even experience the characteristic chest pain. It’s the combination of symptoms that doctors assess to reveal whether you’re having a heart attack, or not. Every seven minutes in the UK, someone has a heart attack.